Finalist, 2018 National Jewish Book Award for Modern Jewish Thought and Experience, presented by the Jewish Book Council A fascinating glimpse into the world of the coffeehouse and its role in shaping modern Jewish culture Unlike the synagogue, the house of study, the community center, or the Jewish deli, the caf is rarely considered a Jewish space. Yet, coffeehouses profoundly influenced the creation of modern Jewish culture from the mid-nineteenth to mid-twentieth centuries. With roots stemming from the Ottoman Empire, the coffeehouse and its drinks gained increasing popularity in Europe. The "otherness," and the mix of the national and transnational characteristics of the coffeehouse perhaps explains why many of these caf's were owned by Jews, why Jews became their most devoted habitu's, and how caf's acquired associations with Jewishness. Examining the convergence of caf's, their urban milieu, and Jewish creativity, Shachar M. Pinsker argues that caf's anchored a silk road of modern Jewish culture. He uncovers a network of interconnected caf's that were central to the modern Jewish experience in a time of migration and urbanization, from Odessa, Warsaw, Vienna, and Berlin to New York City and Tel Aviv. 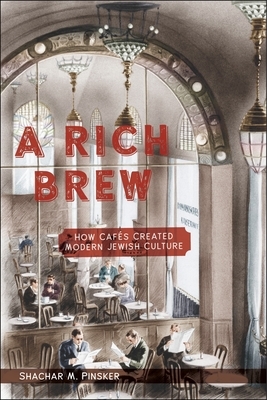 A Rich Brew explores the Jewish culture created in these social spaces, drawing on a vivid collection of newspaper articles, memoirs, archival documents, photographs, caricatures, and artwork, as well as stories, novels, and poems in many languages set in caf's. Pinsker shows how Jewish modernity was born in the caf , nourished, and sent out into the world by way of print, politics, literature, art, and theater. What was experienced and created in the space of the coffeehouse touched thousands who read, saw, and imbibed a modern culture that redefined what it meant to be a Jew in the world.